Design and Energy: Is California's Population Forecast Greatly Overestimated? Is California's Population Forecast Greatly Overestimated? It's ironic now in 2016 that these inland counties forecast for high population growth have some of the worst drought-related problems in the state. Another connection: the California Energy Code Title 24.6 focuses especially on new tract housing in these warmer inland climate zones. Figure 4 shows a huge difference between the trend and the official forecast of nearly 20 million people by 2060. This has significant impacts for all kinds of estimates and policy for the state. Relevant to my work in my work in buildings and energy — and why I became interested in this data — we won't need to build as much new energy infrastructure if our population and demand will be smaller in the future. We won't need as many buildings. Our greenhouse gas (GHG) emissions will not be as high as estimated assuming a growing population. We won't need to choose between the lesser evils climate change or nuclear energy because we have population and economic contraction as a third option. 4) Emigration to other states is increasing again. Here is a story from the San Jose Mercury news about exodus of long-time residents. "California’s skyrocketing housing costs, taxes prompt exodus of residents." It's interesting that the exodus of residents is increasing again, but the state is still attractive to foreign immigrants, who offset this emigration. Figure 7 below from historical Dept. of Finance data shows that residents are increasingly leaving for other states, but foreign immigration has held the growth rate up. The annual population growth has already been declining since 2000, and only saw a brief uptick from 2010-2014. Finally, compare the number of persons added between 2020 and 2060 using the Dept. of Finance forecast and this alternative estimate that I created by extrapolating the current growth rate, Figure 8 below. Which better fits the data and observations of current affairs? Figure 8. Comparison of Forecasts for Persons Added in California 2020-2060. My prediction: California population will shrink by 1 million people in the 2030s, 2 million in the 2040s, and shrinking will continue thereafter. To put this another way, this prediction is a forecast for permanent contraction of the economy, electricity consumption, gasoline consumption, housing construction, mortgage loans, auto sales, student loans, demand for professional services, air travel, vehicle miles traveled, need for schools, college enrollment, and GHG emissions starting in the 2030s (about 15 years from now). What factors would need to change to make this prediction wrong? The decline in birthrates is happening all over the industrialized world, with Japan in the lead. Read more about demographics at Econimica. 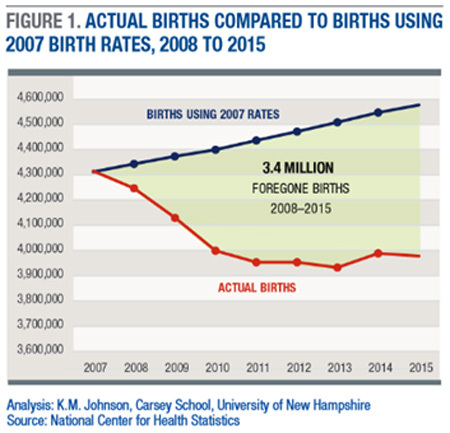 Why are birthrates declining? Theory: Because of diminishing returns on human labor. Young people are finding that it requires two incomes to support a lower standard of living than their parents had from one income. The fundamental reason for diminishing returns on labor may be that industrialized countries have been unable since the 1970s to continue leveraging increasingly inexpensive energy sources (petroleum) to improve labor productivity, and this decline has increased since 2000. At the same time, cost of living has shot up due to asset price inflation. Read more about the energetic basis for falling returns on human labor at Our Finite World. Economists and banks seem upset about demographic slowdown and reversal. There will be fewer consumers to take out new loans and support asset prices. My take is this: Population contraction is great news! Fantastic! Whew, what a relief that it's finally here! Thank goodness that crazy petroleum interlude is coming to an end. We'll be able to spend more time with family. There may be a resurgence of wildlife. Air quality may improve. The stars may shine brighter. Outstanding work! I commend your efforts to bring analytic tools and frankly, common sense, to this idea that California will grow, Grow, GROW! forever. I will be linking to this excellent analysis from my own blog.